A thursday night is usually started with some simple dances to warm up with. Each night there are one or several instructors leading the dance. They decide what dances should be danced and how to dance them. Since our group consist of both new and old members we alway go through all dances. If the dance is new the instructor goes through the dance step by step. If the dance is more simpel someone shows how it should be danced and all other follow the lead. Each dance night we have live music. It usually consist of fiddle, keyfiddle and citra. And sometimes a guitar or other instruments depending on the musicians present for the night. After an hour we take a brake for 15-20 minutes and have coffee. After the brake we go on for another hour or so. The dance usually finishes at 21.30. Our dance company was founded in 1915 in Göteborg by three friends - Arnold Fredin, Nils Carlsson and Henning Löf. The complany soon became big and arranged dance parties and trips to different dancing events. Göteborg National Dans Sällskap – GNDS – was present in Stockholm when the national dance company was founded in 1920. Today we belong to the Göteborg district of the national dance company together with 11 other dance companys in this part of Sweden. The national dance company consist of 22 districts with all-in-all 385 dance companies connected throughout Sweden. We arrange dance nights every thursday, when we meet and dance together. We also arrange parties for easter, midsummer, during autumn and close to Christmas. Every year we usually arrange different types of trips – both abroad and and day trips within Sweden. Week 37 - Try folkdance for new beginners – free of charge. 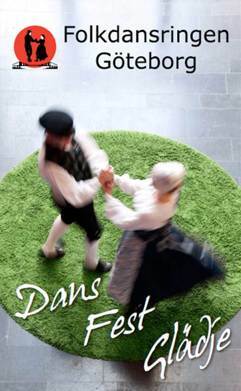 ”THÉdans” - dance and waffles, a sunny spring sunday in march/april – free of charge. Check our calendar for the specific date. We usually have a new beginners cource during the autumn every second year (last time 2012). But if you are interested to come to us and learn we are happy to find an occation when you can try dancing or playing any time of the year. Please contact us – see right side for options. Folkdance is usually interpreted as dances from the 17:th century or earlier. The dances have been practised by ordinary people and taught by tradition rather than in schools, A lot of the dances have been documented and there are some that have been coreographed for stage. Folkdances consist of a wide range of types, some with the roots in the medeeval dances and some composed more recently. Through the years the dances have changed due to influences from other cultures, by fashion or just because they have been danced in different places. Among the folkdances there are dances for couples or a group of couples. There are also dances where three dancers dance together or another fixed number of dancers. In some dances the number of dancers is not significant, you can be as many or few as there are dancers. When you dance you usually dance in a circle, a square or in parallel lines. The specific dance can be performed as a wrigling snake or totally free in the room. Sometimes the same dance change in shape from lines to a circle or any other combination. One of the fun things with folkdances are the variations, the nice music and the people you meet. And you get good excersice at the same time!